The wilderness is more than a place of recreation. It's a place where we find ourselves and connect with nature. The purpose of this project was to improve how people experienced Saltwater State Park in Des Moines, WA. Our objective was to improve the experience by increasing information density and incorporating technology to improve rather than detract from the state park experience. This project was completed over two months for the "Designing Information Experiences" class taught by Associate Professor Jacob Wobbrock in the Information School and Computer Science & Engineering department at the University of Washington in Seattle. Our process broadly followed the Stanford "Design Thinking" method. Of course, between each step, there were allowances made to go back to earlier steps to keep the focus of the project well defined. We completed our project in June for our presentation. Our solution is a network of kiosks with an experience-enhancing user interface located at strategic points in Saltwater State Park. Design Problem: what do the users actually want? While doing user research, my team and I discovered that most signage at the park was poorly marked and different maps were differently designed, making it hard to change mental models. The “information” board was sparse and lacked any extra information, beyond functional phone numbers and volunteer information, that could have enhanced the visit of the park. a) What (if anything) is lacking in the information experience at Saltwater State Park? b) Why do people come to Saltwater State Park? d) It is large enough to have different kinds of topography like a jungle, a beach, and climbs. It has 1,500 feet of shoreline on the Puget Sound between Seattle and Tacoma, with 88 acres and 80 campsites. 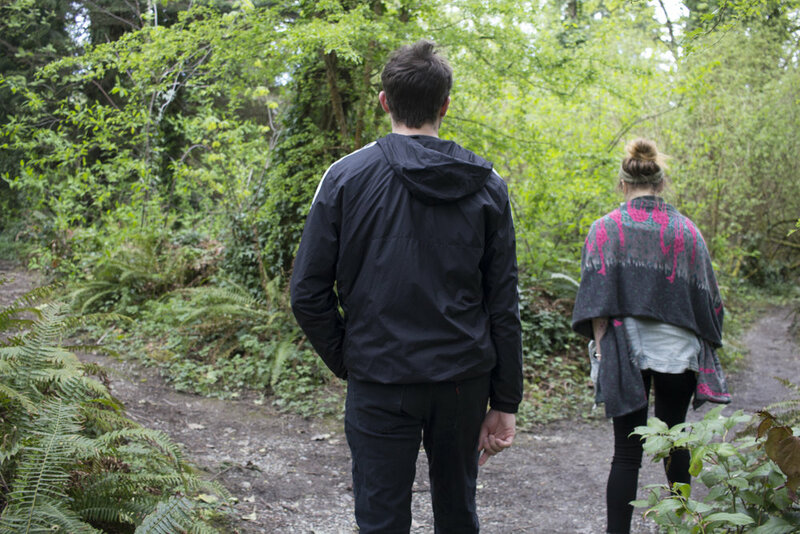 The team members took the role of “user” of the park by walking along the beach to watch for wildlife, identify a trail, and go on a short hike. In addition, 3 to 5 hikers and park visitors were also interviewed, including an individual, a couple, and an older woman. While approaching the park as a users, the team spotted deficiencies in signage and inconsistent design styles. But when asking the visitors, the team didn't find many complaints about signage. Based on our interviews and research, we created two personas to better understand our users and provide yardsticks against which to measure our ideas. My team and I realized that improvement of the park experience could only happen if the information experience improvement (i.e. 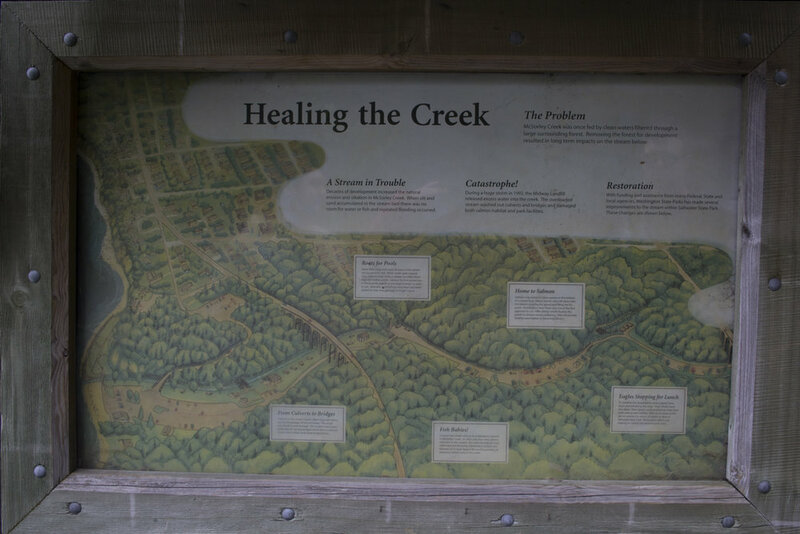 the signage issues and inconsistent mapping) was directed at connecting better with the nature, history, and community of Saltwater State Park. How can we design to enable visitors to fully experience the environment and history of Saltwater State Park? In approaching ideation, I was deeply involved in making the initial process as broad and possible and then converging multiple times to bring out a kiosk prototype that we tested with users. The idea we voted on initially was an AR app that would automatically identify flora and fauna when they pointed their cellphone camera at the object. We quickly realized that to improve the experience of the park, we had to incorporate our other ideas to have a holistic experience. This included remedying many of the existing problems by adding more features to the app. While it was initially only an AR based identifying app, it quickly swelled to have a virtual ranger, geocaching, a ranger finder, a physical livestream etc. I also realized that it may have been exclusionary to have such reliance on an app given our persona Penelope's advanced age. Older people may not have access to smartphones. So we decided to make an identical interface on a kiosk for our mid-quarter presentation. a) The scope was too broad. We needed to narrow the scope. b) The cellphone would literally get in the way of experiencing nature. We needed to eliminate it. a) Removed the app: The app would literally get in the way of people experiencing nature. 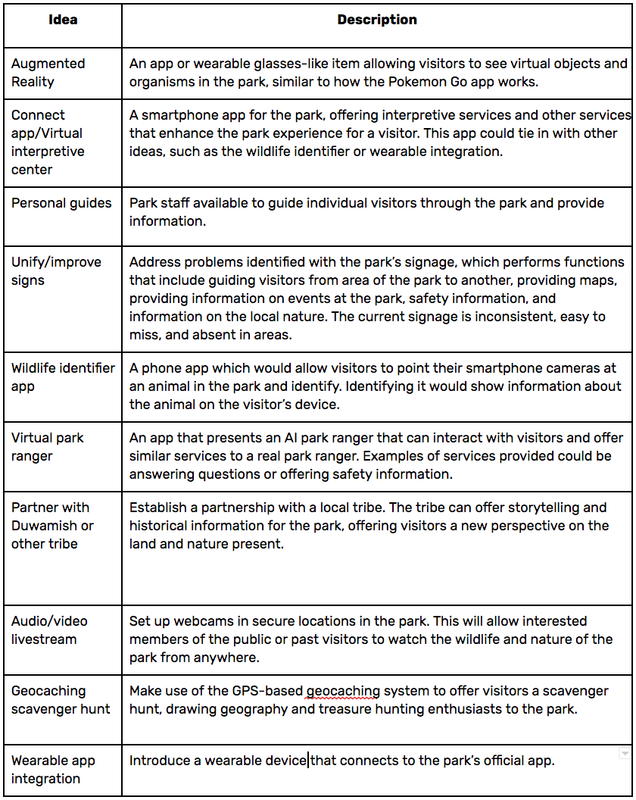 Most of the killer features (live updates, maps, park encyclopedia, the virtual ranger) would remain in the kiosk. b) Removed superfluous features: We decided with the kiosks to only focus on a few features instead of many. The map would be made paramount (since that's what most hikers and walkers wanted), and the virtual park ranger (now named "Ranger Reggie") would be made a systemwide feature. In creating the first prototypes, I and my teammate Eric decided on the user flows before creating the basic layout of the screens. One of the liberating aspects of designing screens for a kiosk was that we didn't have to refer to existing UI guidelines which companies like Google and Microsoft have. The basic layout was created with basic interactions on Marvel. While the early prototype was relatively crude, the basic layout already existed, with circular buttons, the state park logo, and Ranger Reggie occupying a prominent place. Based on our early prototypes, user research, and ideation, I created with the team a customer journey map to talk about the lows and highs that they will face as they go through their "journey" at Saltwater State Park. a) Understanding the users as customers helped us better understand their experience beyond just the park. E.g. the journey map considered the process of choosing Saltwater State Park as well. b) It helped us identify actors beyond just the park and the animals. We took into account the park staff schedule, the pay station, and developers who might make the first version of the kiosk. Task: Locate your position on the map. Task: Choose a trail and go to its page. Completion criterion: Getting to the pop-up menu, clicking on one trail and landing on the trails page. Task: You want to find out about the local wildlife. How do you do it? Completion criterion: Click on “Park-o-pedia”, click on animals. Task: You want to start afresh. Go back to the home screen. 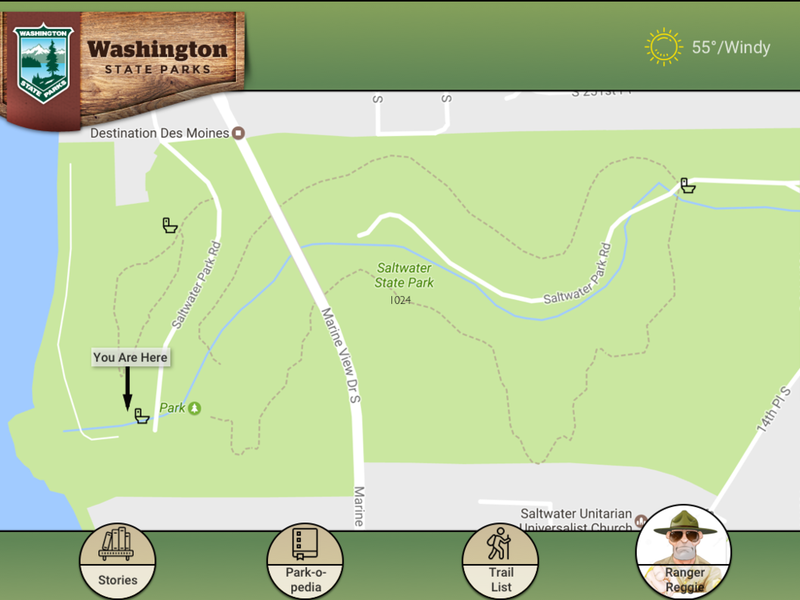 Completion criterion: Either click on “x” or on the Washington Trails logo. Task: You want to find out more about the history of the park. Completion criterion: Going to the Ranger Reggie screen. Task: You get an alert. Can you find what the alert asks you to find? Task: You’re not really interested in the alert anymore. How would you have it removed? Completion criterion: Click on “x” button. We used an iPad to host the interactive prototype. The physical aspect was a library space with a whiteboard, where a park “scene” could be drawn. This was chosen to test one kiosk and how it would lead to further interactions with the surrounding “park” in a cheap way. The iPad “kiosk” was mounted on a cardboard box propped up on a chair found in the library. In order to integrate the kiosk into the surrounding “nature,” a team member bought a shower curtain with leaves on it to simulate integration. My team and I tested three students who approximated the age and demographics of our persona Jeremy. I was the moderator for one session and note-taker for another. People had trouble making sense of the maps. They wanted to know where utilities and toilets were. They had trouble finding their way back to the home screen. The “You Are Here” text seemed interactive. The “Ranger Reggie” button looked like it should’ve opened a chat of some type. Unclear maps: This spoke both to the maps themselves and the lack of a legend. The North vs. South trails were hard to identify. User control: All three users had some trouble finding a way to get back. One even suggested a home button. Unclear interactions: The “You Are Here” text seemed interactive. The “Ranger Reggie” button looked like it should’ve opened a chat of some type. The final interactive prototype is shown below. My team and I also created a video to show how the final product would be used in a real life environment. Enjoy! Designing a holistic experience for me was a matter of teamwork and hard work, which is perhaps a bit obvious for all design projects. What makes this project different is the “holistic” portion. To design an “experience” and not a product requires a much greater knowledge of context and user motivations beyond just their motor goals. Creating an organization for bring an experience about was possible because all my teammates were using the same theoretical basis to create the experience. An actual organization that provides experiences would be more difficult depending on the industry. From a usability testing perspective, I learned the importance of context to testing a prototype. While traditional usability testing focuses on strict lab-based testing to see how certain features work and how the user responds, experience prototype utilizes the environment the product will be used in as an important variable. From a teamwork perspective, I learned to work more as a team player than usual. I tend to lead the teams I’m in and guide the team. This time, I understood that everyone in the team had different skill sets, and we all took on different leadership roles depending on the context. From my perspective, I led the whiteboard sessions during ideation, Eric led the refinement processes of the design features, and Erin took on the role of organizing meetings and ensuring the team was on the same page.